How Vicker’s Hardness Test is conducted? The ability of a material to resist indentation or penetration is called Hardness. To test the hardness of any material is simply forcing an indentor into the surface of the metal by applying the load. There are different methods are developed to test this hardness. In the previous article we have discussed The Brinell Hardness test, the Rockwell Hardness test, this article, we are going to discuss one of the hardness testing method called Vicker’s Hardness Test. Vickers hardness testing also is known as the Diamond pyramid hardness test. Because we use the Diamond pyramid as the indenter. The same testing machine which is used for the Brinell hardness testing machine can be used for the Vicker’s hardness test also. Unlike Brinell hardness testing, we do not need to change the indenter for the different materials. we can use the same Indenter for all the material types. In Vicker’s Hardness testing we use the same testing principle as the Brinell Test. Only thing is that the Indenter will be changed. Here the Vicker’s hardness number will determine the Hardness of the materials. Due to Indent on the specimen or the testing component, few situations this method is not suitable for the Finished products. Even though the indent impression is comparatively small when compared to the Brinell Hardness Test. The Testing specimen should have a smooth and flat surface. Before we test, we have to clean the surface from dirt. Indent is very small so we can use this test to test the very thin sheets, foils, small materials. 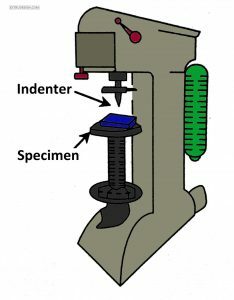 One testing machine can be used for both the Brinell test and the Vicker’s test. We have discussed how the test is conducted and the principle of the Vicker’s hardness test. and also we have discussed the precautions that we have to take before we begin the test. The limitations of the Vicker’s Hardness test and the advantages of this testing machine also explained. If you have any thoughts, please let us know in the comment sections below.